One of the two mandates of the ILA Human Rights Law Committee (2009–2016) was to examine the contribution by the ICJ to international human rights law. The Committee reported on this at the Washington Conference 2014. 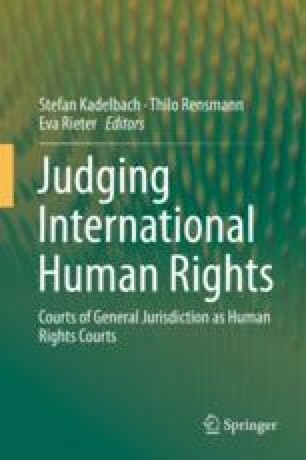 This report discusses the ICJ’s treatment of decisions by human rights bodies. In addition, it focuses on some of the contributions by the ICJ to human rights law in specific areas, even without a clear direct impact of the case law of the human rights bodies. The discussion, covering case law until 2013, includes the Court’s attitude toward the position of the individual in general, its case law on the extraterritorial application of human rights treaties, and its practice regarding provisional measures involving human beings. This is a slightly edited version, for purposes of this volume, of paras 19–88 of the interim report of the ILA Committee on International Human Rights Law, Washington Conference 2014, reprinted in ILA Report 2014, at 476–501. The report was finalized by ILA Rapporteur Eva Rieter, with input by the other Committee members, in particular Stefan Kadelbach, Liliana Jubilut, Christina Cerna, the late Nigel Rodley and the late Peter van Krieken, as well as by those participating in the ILA committee meeting in Bellagio, Italy, June 13–14, 2012. The findings of the report were endorsed by the ILA Johannesburg Conference in Resolution No. 2/2016, reprinted in ILA Report 2016, at 20–21.